The contrast could not have been greater. Twelve months ago Red Bull ended this equivalent race weekend reeling from a Turkish inquisition; a collision between their two drivers prompting allegations from Mark Webber that the team favoured their young German wunderkind, Sebastian Vettel. The resulting media frenzy caused the outfit to clam up, the poisonous atmosphere threatened to bury their world title hopes. It did not, of course. Red Bull eventually won both championships in a thrilling climax to the season. The worry for their rivals, just four races into this one, is that the experience gained from that rancorous campaign makes this yearâ€™s a foregone conclusion. McLaren won in China last month, outthinking Red Bull on strategy. But such occasions are rare and, in truth, they have been chasing Red Bullâ€™s tail for the best part of two years. On Sunday, Lewis Hamilton and Jenson Button finished where they started â€” fourth and sixth â€” their frustration compounded by the fact Fernando Alonsoâ€™s Ferrari appears to have leapfrogged them in race pace. 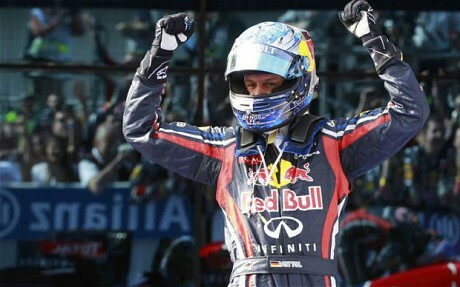 The Spaniard pushed Webber hard for second but was passed by the Australian six laps from the end. Red Bullâ€™s one-two was predictable and contained not a hint of controversy. Afterwards the whole team appeared calm, satisfied with a job well done. Christian Horner, the team principal, warned against complacency. Webber accepted his second place graciously. As for Vettel, at 23 he is not even old enough to drink the victory champagne he sprayed from the podium. Tough new licensing laws in Turkey have raised the minimum age at such events to 24. But he looks a totally different proposition to the callow, often petulant youth who stormed off track last year having torpedoed his older team-mate while the pair vied for the race lead. The statistics he is amassing are frightening. Having claimed his fifth pole in a row on Saturday, Vettel has now won six of the past eight races stretching back to last season. This was the 13th win of his career. He is fast closing on Hamilton, who has two more. Vettel even has the expectation-dampening sound bites. â€œA good start to the season always helps,â€ he said. â€œBut there is a long way to go. Four races out of 19, so you can work out how many more points there are to get. Vettelâ€™s victory had never really been in doubt from the moment he reached the first turn in the lead. For all the talk of tyres and chaotic races â€” and there were 82 pit stops, the most in Formula One history â€” if the fastest car is out in front its driver can cover his rivalsâ€™ stops with relatively little fuss and assure himself of the win. And so it transpired. While behind him there was no shortage of skirmishes â€” notably an excellent but ruinous battle between Button and Hamilton, which wore down the latterâ€™s tyres â€” Vettel sailed on serenely. Hamilton had his own problems, a bad pit stop when a wheel nut was cross-threaded cost him a chunk of time. But he finished more than 30 seconds down on Alonso and fourth was probably the best he could have done. To complete a disappointing day for the British, Force Indiaâ€™s Paul di Resta failed to finish an F1 race for the first time after his car suffered an as-yet unidentified problem. Vettel had no such reliability issues. That is another thing to have changed from last year. â€œHeâ€™s in phenomenal form,â€ Horner conceded.